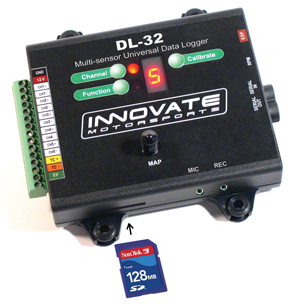 Innovate DL-32 (32 Channel Vehicle-Mounted Data- Logging System). The DL-32 is a complete vehicle-mounted data-logging system for advanced engine tuning. The system is anchored by Innovate's award-winning digital wideband air/fuel ratio technology, but also includes flexible sensors for RPM, MAP, temperature, duty cycle, and analog inputs. The DL-32 is also a key component of Innovate Motorsports' Modular Tuning System (MTS). Using the DL-32's serial ports you can daisy-chain other Innovate devices such as the XD-16, AuxBox (LMA-3), LC-1, TC-4, and SSI-4.